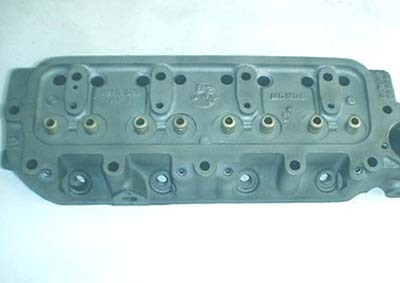 Throughout it's manufacture, variations of the original MGB cylinder head design were produced. The following information relates mainly to North American spec cars and should not be considered whole or complete, but is true and correct to the best of our knowledge. Anyone possessing greater knowledge is invited to e-mail us for additions or corrections. We'd like to make this page a "landmark" for MGB enthusiasts the world over. 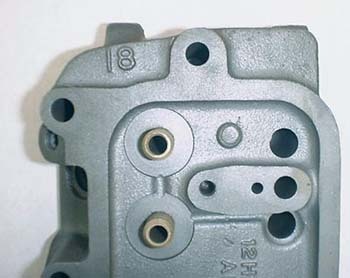 The earliest heads used (model year 1964-1965) on MGB's were casting number 12H-906. They were equipped with 1.5625" inlet valves and 1.343" exhausts. The rocker pedestal oil feed hole is in-line with the bolt holes. The combustion chamber type is "closed" with a depth of roughly .400" and a volume of around 42cc's. 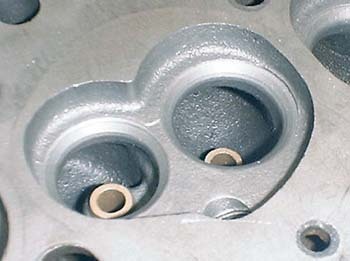 These heads did not require exhaust valve cut-outs in the block and provided 8.8:1 compression with the shallow dish pistons used in earlier engines. These heads were fitted with "Type A" valves, spring hardware and dual springs. 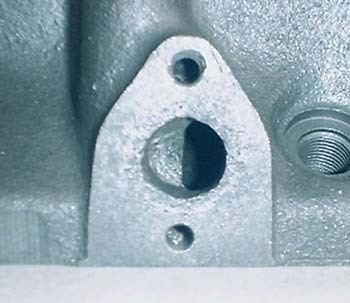 The casting number is easily seen in the above photo as well as the in-line oil feed hole for the rocker shaft. This head was retrofitted with Type-B hardware. The deep, closed style combustion chambers characteristic of all the earlier heads as seen in this photo. 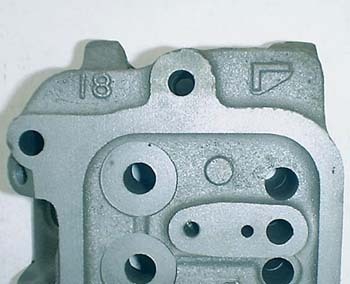 The next heads used (model years 1965-1968) were casting number 12H-1326, which provided an improvement in casting quality. These heads have 1.5625" inlet valves and 1.343" exhausts and the rocker pedestal oil feed hole is in-line with the bolt holes. The combustion chamber type is "closed" with a depth of roughly .400" and a volume of around 42cc's. 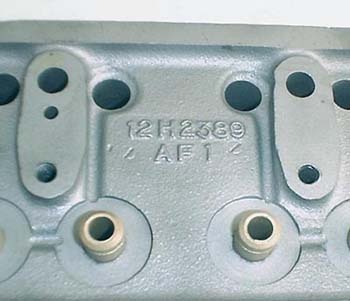 These heads do not require exhaust valve cut-outs in the block and provide 8.8:1 compression with the shallow dish pistons used in earlier engines. These heads were fitted with "Type A" valves, spring hardware and dual springs. 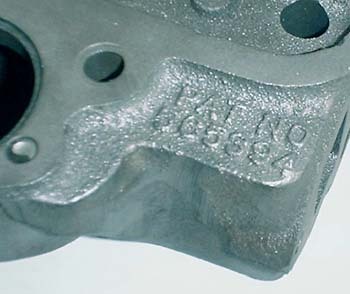 The casting number is seen in the above photo along with the in-line oil feed hole for the rocker shaft. 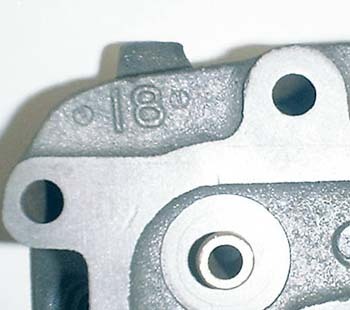 A large 18 is cast in the rear of these heads, assumably denoting the head as proper for use with the 1800cc engines. For model years 1969-1971, casting number 12H-2389 was used, this being the first of the "smog heads". The biggest change over from the previous heads being addition of the air injector holes destined to adorn all further renditions to come. These heads were still equipped with 1.5625" inlet valves and 1.343" exhausts. The rocker pedestal oil feed hole is in-line with the bolt holes. The combustion chamber type is "closed" with a depth of roughly .400" and a volume of around 42cc's. 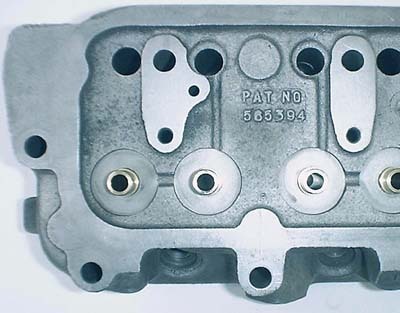 These heads do not require exhaust valve cut-outs in the block and provide 8.8:1 compression with the shallow dish pistons used in earlier engines. These heads were fitted with "Type B" valves, spring hardware and dual springs. 2389 heads were the first to come with the air injector ports clearly visible in this photo. 2389's also have 18 cast in rear to denote 1800cc engine size, again the air injector hole is obvious at upper left. Starting in 1972 and lasting until about 1974 and a half, casting number 12H-2923 was used, this being the only production "big valve" head. We have also seen this same head with casting number 12H-2709 or 12H-2708 in European guise (without the air injector ports). These heads had two major changes from the 2389, one being the new 1.625" inlet valves and the other being a newly revised "open style" combustion chamber. These heads were still equipped with 1.343" exhaust valves. The rocker pedestal oil feed hole is in-line with the bolt holes. The combustion chamber depth is roughly .375" and has a volume of around 38cc's. 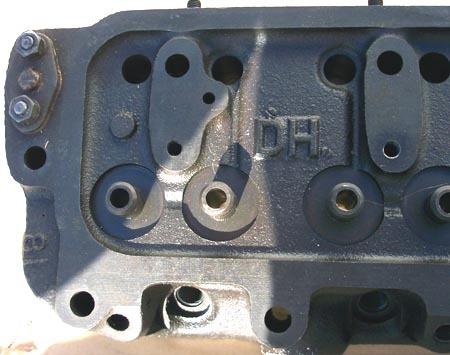 These heads do require exhaust valve cut-outs in the block and provide 8.0:1 compression with the deeper dished pistons used in the new, later style engines. Because of the larger valve sizes and shallower chamber, these heads are commonly sought after items for racing and high performance use. 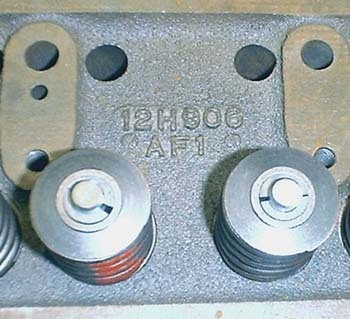 These heads were fitted with "Type B" valves and spring hardware, but only used single valve springs. These heads were the first to use the open type chamber seen above. They are actually smaller in volume because they are shallower, this also necessitates the use of exhaust valve cut-outs in the block. Other distinguishing markings usually include an externally cast "L" at the rear of the head as seen here. 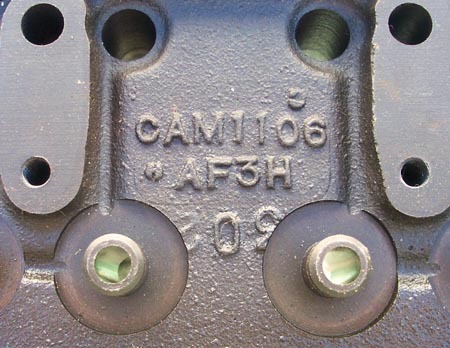 Just as the 2923 heads were being phased out (about 1974), casting number CAM-1106 became the standard North American issue up through the close of production. These heads have some distinct differences over their predecessors. While still equipped with 1.343" exhaust valves they were only fitted with the now smaller 1.5625" inlets. 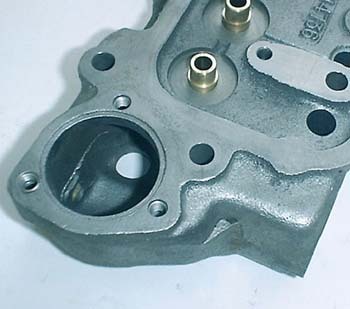 The rocker pedestal oil feed hole location was changed to be offset with the bolt holes and a new water choke outlet port was located at the back of the head to supply the water heated choke of the Zenith Stromberg carburetor. The combustion chamber depth is roughly .375" and has a volume of around 38cc's. 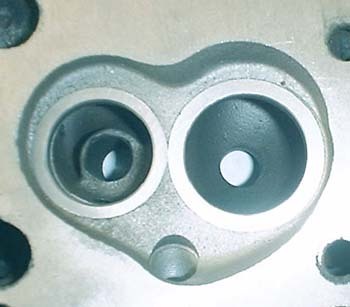 These heads do require exhaust valve cut-outs in the block and provide 8.0:1 compression with the deeper dished pistons used in the new, later style engines. Because of their "smog car" association, these heads are not commonly sought after for performance use, but can work just as well as earlier models once modified. These heads were fitted with "Type B" valves, spring hardware and single springs. Some (but not all) of these heads were induction hardened to better cope with newer unleaded fuels, however this possibility should not be relyed upon. 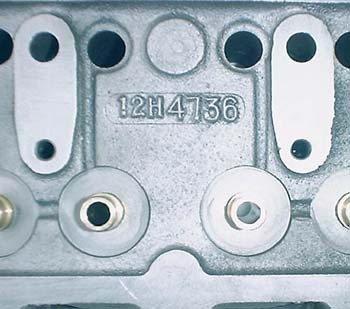 The casting number is located further forward on the cylinder head than in previous models as seen here. This large "DH" is apparent in some models. Others have different letters, but we're not sure what they mean. Also of note in this picture is the offset oil feed hole and water choke outlet at the rear of the head (shown blanked off). Special thanks to "MGB Paul" for the CAM-1106 pictures. We've found the 12H-4743 heads to be perfect copies of the CAM-1106 heads. Our knowledge does not extend far beyond that statement at this time. 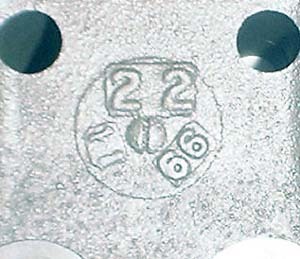 The casting numbers on these heads are located towards the front, therefore the rocker pedestal oil feed is not seen in the above photo. 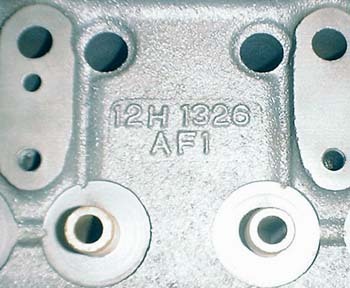 This photo shows the relocation of the patent number, as well as the offset oil feed hole for the rockers. 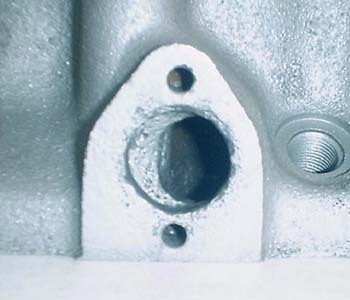 Note that this head has not been drilled for the water choke used on later cars, even though it's a later type casting. The air injector holes were drilled, but later plugged by a previous owner on this particular head. A sure giveaway of the 12H-4736 head is the smoother exterior appearance with the patent number being relocated inside the rocker area. Early heads (up until 2923) used a smaller opening for the heater port. With heads 2923 and on, the hole for the heater port was enlarged. Our assumption is this hole was made bigger to help facilitate the removal of casting sand. The hole in the heater valve is smaller than either of these, so it shouldn't have anything to do with coolant flow. Early heads (up until 2923) were cast with an easily read date code, this head was cast on November 22, 1966. 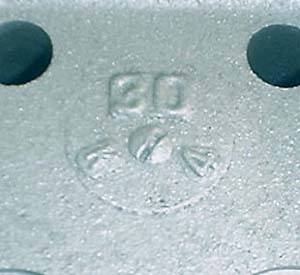 After British Leyland took over, the casting date code changed to the pattern seen above. We belive the code can be read as the 30th day of October, 1974, where the letter references the month. In reading this as such, we are making the assumption that the letter "I" would be omitted due to it's possible confusion with the number 1. Special thanks to everyone who submitted e-mails regarding this subject! 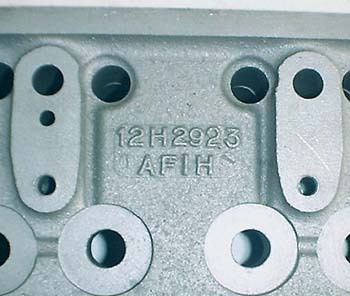 All heads with the exception of the 12H-4736 castings had a patent number cast externally at their front, as seen above. Note should be made that some Indian-cast, aftermarket copies of these heads exist. Our finding is these heads have questionable core positioning and may not be suitable for use in performance applications. These heads can be identified by the casting marks and we'll get some photos up when possible.